The PCs arrive at a well-known mining operation’s base…the issue, though, would be that it’s gone. In its stead, there lies a chasm filled with inky blackness, the result of a weird meteorite – the fall of the it has resulted in truly strange creatures – like giant toads covered in glowing toadstools. Highly acidic acid bubbles burst, stones may cause insanity; a goblin was turned into a monstrosity of warped legs with tentacle-like bits; intestines have congealed into a slug-like thing and what was once a wyrmling living nearby is now something completely different – investigating the strange place will certainly yield some seriously interesting, horrific foes…and can be seen as a masterclass example in practice on how to properly reskin monsters to make them feel fresh and new. While the 5E-version doesn’t have random encounters, its conversion is rather detailed – in the original, this was a crashed space-ship and this version changes the strange proceedings and hazards rather well. 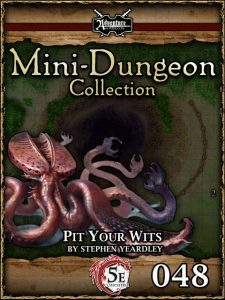 Stephen Yeardley proves that he can do the horrific just as well as the creatively weird here – the mini-dungeon shows with perfect ease how you can reskin monsters and make them truly unique encounters, how you can logically and cohesively establish a thematic leitmotif in a mini-dungeon and run with it. This is a fun excursion, and while I personally bemoan that the 5E-version loses the science fantasy component, The person who tackled the conversion has done a great job at changing the theme in a consistent manner and since 5E has so far significantly less source-material to work with, I get the decision. I can’t comment on who did it, since it doesn’t specify the conversion specialist. However, none of the hyperlinks in this pdf are functional, which constitutes a slight comfort detriment. My final verdict will hence clock in at a well-deserved 3.5 stars, rounded up for the purpose of this platform.